Much more than just selling equipment, Universal Motion Inc. (UMI) desires to meet the needs of its customers. With this purpose in mind, UMI does its best to understand their problems and present the maximum number possible of solutions. Universal Motion Inc. staff is highly concerned about the equipment application, norms and procedures to be followed, types of tests, operation of machine etc., in order to guarantee its customers' satisfaction with equipment and services. UMI has now become reputed company in manufacturing and supplying of complete range of Material Testing Machines like dynamic testing machine, creep testing machine soil testing equipment and concrete testing equipment etc. 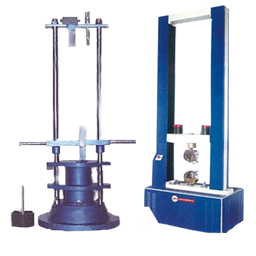 With our consistent quality machines & equipment, we are counted among leading Dynamic testing machine and creep testing machine manufacturers & exporters in the market. In addition we also supply & export micro hardness tester as per the requirements & specifications of the customers. The combination of technology developed, and the quality employed in its products, results in products that can most closely meet its customers' needs, giving them neither more nor less than what they actually need. UMI with the experience that it has acquired since 1998 has supplied many of machines in the Domestic & International Market. Now it is introducing its products, technology and updated quality, to satisfy the world market at very competitive prices and services. UMI and its experienced team, made up of specialized professionals, is always looking for new ways to better meet the demands of the Domestic and Overseas Markets. The company offers exclusive machines such as dynamic testing and creep testing machine that are essential for quality control, product and material development, research industries, technical educational institutions, research institutes and also in mechanical test laboratories etc. UMI machines are designed with the objective to conciliate the real needs of the market and the resources and materials available for production. UMI always has the ideal equipment for the market. UMI has always worked hard to optimise the cost-efficiency of its products. As a result of these efforts, UMI offers its products for extremely competitive prices, which are unbeatable by its renowned competitors. UMI is aware of its technological contribution with every machine that it delivers. Therefore it is also aware of the importance of its responsibility. UMI technicians are trained to render customized services, in an ethical and responsible manner. Much more than just selling equipment, UMI desires to meet the needs of its customers. With this purpose in mind, UMI does its best to understand their problems and present the maximum number possible of solutions. UMI staff is highly concerned about the equipment application, norms and procedures to be followed, types of tests, operation of machine etc., in order to guarantee its customers' satisfaction with equipment and services.